Looking for an easy treat to serve during the BIG game this weekend? 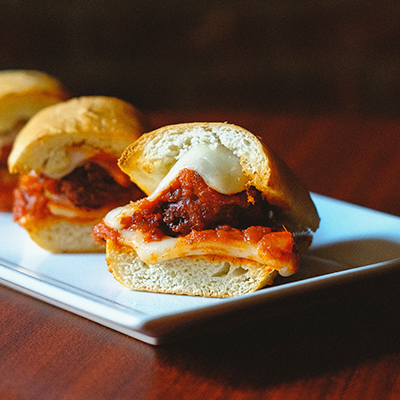 We love these tasty Game Day Meatball Sliders! Start by preheating the oven to 350 degrees. Line the bottom of a casserole dish with the bottoms of one pack of slider rolls (approx. 15 rolls). Next, add your 15 previously cooked Our Best Italian Style meatballs and cover with spaghetti sauce. Then top off with shredded mozzarella and provolone cheese. Next, place the top of the slider buns over the meatballs and brush with olive oil and sprinkle with your favorite Italian seasoning and parmesan cheese. Lastly, bake covered with aluminum foil for 10 minutes and another 8-10 minutes or until golden on top! Now your sliders are ready for game time! A weeknight, family favorite that will come together in a flash! Cook the meatballs according to the bag directions. Meanwhile, cook the pasta according to the package directions. Reserve ¼ cup of the cooking water; drain the pasta and return it to the pot. While the meatballs and pasta are cooking, heat the butter in a large skillet over medium heat. Add the parsley and thyme and cook until tender, 8 to 10 minutes. Toss the thyme mixture with the pasta, meatballs, spinach, cheese, and the reserved cooking water. Season with ½ teaspoon salt and ¼ teaspoon pepper. Submit Your "Our Best"® Recipe Today! Check the "Our Best"® Facebook page for recipes submitted by our valued customers and submit your own today! 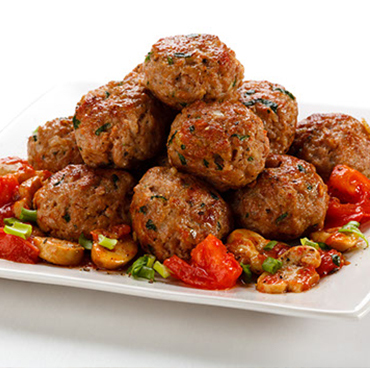 If you have a great recipe using our burgers, meatballs, and more, please tell us about it! We love to share new ideas with our customers. Click here to submit your recipe today.